When you talk aircraft history, it is inevitable not to mention the American Wright brothers. Wilbur and Orville were two brothers with four years in between them. Throughout their lives, they had been fascinated by the dream of flying. In December 1903, they took the world’s first flight with a motor-driven machine. The flight was not very long. They flew only 59 seconds, but they managed to fly almost half a kilometer. Their struggle to get in the air had not been easy. Many people before them had tried to operate flights with a machine that had denser than the air around them, but without success. 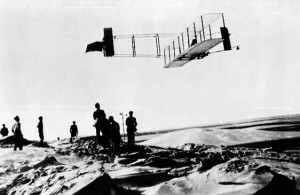 The Wright brothers’ flight later became the most important and revolutionary part of the aircraft history as we know it today. The brothers Wilbur and Orville in the air for over nine minutes October 24, 1911 in North Carolina. It was not just the Americans and British, who wanted to play along when there was talk of flight. A Dane named Jacob Ellehammer also takes a very important part in aviation history. Ellehammer was known as an aviation pioneer and inventor. He made his first aviation experiments in early 1906 in Lindholm, but the outcome was not what Ellehammer had hoped. He knew he had to change something drastic for it to ever be possible. Ellehammer therefore built a new engine for the plane, as he believed that it was due to a lack of power. The new engine had 18 horsepower. By then he built an engine that had twice as much horsepower as the previous one. In August 1906 Ellehammer managed to get the machine to lift itself. Just one month later he succeeded in getting the machine to remain airborne. Today Ellehammer is regarded as one of the biggest European aviation pioneers. It took over thirty years from first flight to when the first jets were made. This was a German machine named Heinkel. It was a very fast aircraft that could fly 650 km/h, which with conviction was the fastest aircraft at the time. The jet planes are very different from propeller planes because they have better performance in the air. Likewise, they are better at handling heights, they also attractive military aircraft. Later we succeeded in creating aircraft that flew at supersonic speeds. These are not traditional airliners, but primarily aircraft for military use.